Allergies and allergic reactions can present themselves in many different ways and can be caused by very diverse triggers. While the immediate cause of allergic reactions is an overreaction of the body's immune system, the higher prevalence of allergies among women of reproductive age – especially during certain delicate periods like puberty, pregnancy and menopause – points out to a less evident link to hormonal function. Fortunately, as with all symptoms triggered or exacerbated by hormonal imbalance, there are ways to manage allergies during these transitional times. Continue reading to learn more about allergy causes, risk factors, symptoms, signs, prevention, and treatment options. Around 20% of all people in the U.S. suffer from some sort of allergy. Allergies are the number one cause of school absenteeism and one of the top five causes of lost productivity in the workplace. Family history and genetic material is a major part of their prevalence; identical twins have a 70% change of suffering from the same type of allergic reaction. Allergies are defined as the excessive and abnormal reaction of the body's immune system when confronted to a usually harmless substance, known as an allergen. For reasons that are not completely understood yet, these allergens confuse the immune system, making it believe it is under a real threat. This causes an allergic reaction that may present itself in a very wide range of ways, depending on the type of allergen and the organ the reactions is affecting. While some allergies only affect children and may heal on their own after a few years, for many people they remain a problem throughout their entire lives. In particular, certain types of allergies - asthma and hay fever, for example - become much more prevalent among women once puberty is reached, and are frequently exacerbated during a woman's menstrual cycle, pregnancy, or the years leading up to menopause. While the presence of allergies themselves do not have any correlation to a woman's fertility, their sudden exacerbation is a common sign of hormonal imbalance. This imbalance, in turn, may eventually influence other aspects of a woman's life, causing a wide array of other uncomfortable symptoms and possibly even affecting her ability to conceive. Allergies can present themselves in very different ways from person to person, forming a very unique experience for each. However, there are two main criteria that can be used in order to identify and classify allergies: according to the type of allergen that sets them off and by the type and intensity of allergic reaction that is being experienced. Please continue to learn more about the hormonal and non-hormonal processes behind the onset of allergies. Allergies are caused by an unusual reaction of the body's own immune system. When the immune system detects certain substances - known as allergens - and mistakes them as threats to the body, as if they were viruses or harmful bacteria, it produces an antibody known as IgE. This quickly sends the message that the body is “under attack” and inflames certain organs through an additional substance known as histamine. Although the exact causes that make certain people sensitive to specific harmless substances are complex and not completely understood, most doctors and researchers believe hormonal changes are a major cause in the development of new allergies, or in the aggravation of their symptoms. In addition to these completely normal hormonal causes, other factors and medical conditions can, in more rare instances, exacerbate existing allergies. Continue reading to learn more about hormonal and other causes of allergies. Hormones are chemical messengers that control every organ in the body. When fluctuations occur, organs don't receive the correct signals to function adequately. So, hormonal disorders occur. In this sense, we can say that allergies may be set off or exacerbated by the hormonal fluctuations during the transitions women go through during their reproductive lives. The hormones estrogen and progesterone, which are in charge of regulating a woman's menstrual cycles and fertility, influence the production of several other hormones and neurotransmitters, such as serotonin, adrenaline, and cortisol, which control appetite, sleep, sexual desire, and memory. In particular, cortisol is one of the neurotransmitters that are most closely linked to the immune system since its main job is to regulate the body's fight or flight response. Medical researchers have found that fluctuating levels of hormones, especially estrogen and cortisol, make women more susceptible to developing new allergies or to feeling like their existing allergies are becoming more aggravated, hence the reason why more women experience allergies during times of significant hormonal imbalance, such as puberty, PMS, menstruation, pregnancy, post-partum, and menopause. 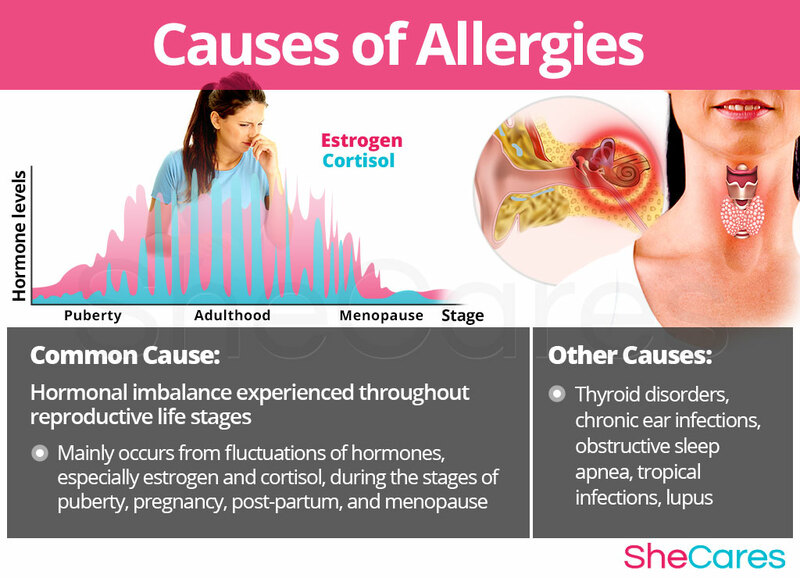 The irregularities in estrogen and cortisol levels during these stages cause allergies to increase, in particular the respiratory types such as asthma or rhinitis. Furthermore, there are also specific hormonal causes according to the stage of a woman's reproductive life in which this disorder appears. These specific hormonal causes, combined with other factors, can influence a woman's individual experience of allergies during puberty, pregnancy, post-partum, and menopause. Puberty is the stage in which a girl's body begins to produce reproductive hormones; these and other factors, such as her first period and poor dietary habits, contribute to allergies during puberty. Pregnancy leads to abrupt and sharp changes in the body's hormonal levels, which can alter a woman's symptoms of allergies. Post-partum and breastfeeding is another stage where reproductive hormones are commonly imbalanced and cause problems with allergies. Also, new moms may have to watch out for allergies in the newborn. Menopause is the stage in a woman's life when production of reproductive hormones naturally slows down, and her fertile period ends. As well as direct hormonal causes, there are other factors that could be worsening allergic symptoms. Because allergic processes involve different chemicals and organs, there are several conditions that may mimic the symptoms of a specific type of allergy. Although much less likely, these conditions include thyroid disorders and certain infections. 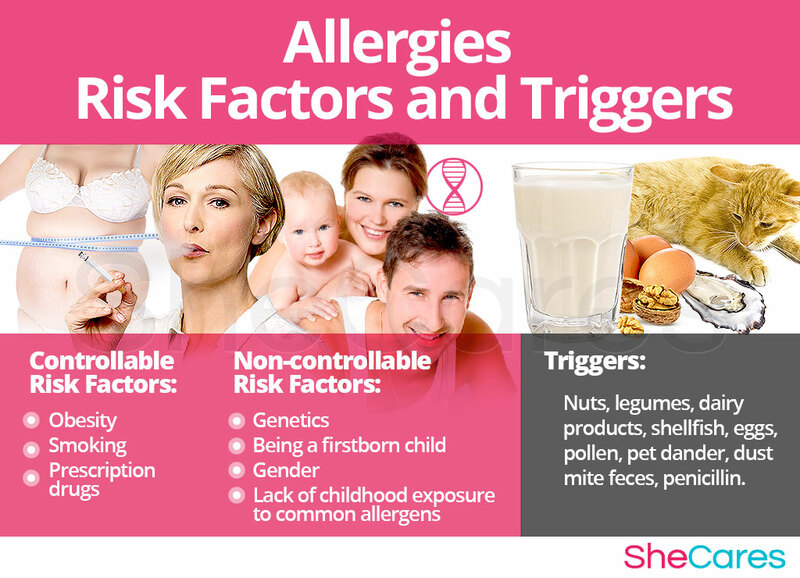 Keep reading to learn more about the risk factors that make allergies more likely, as well as the most common substances that trigger them. Some women are more likely than others to suffer from allergies for inherent psychological, behavioral, and health reasons. These predisposing factors can affect a woman's hormone levels and increase her chances of developing allergies during her reproductive life. 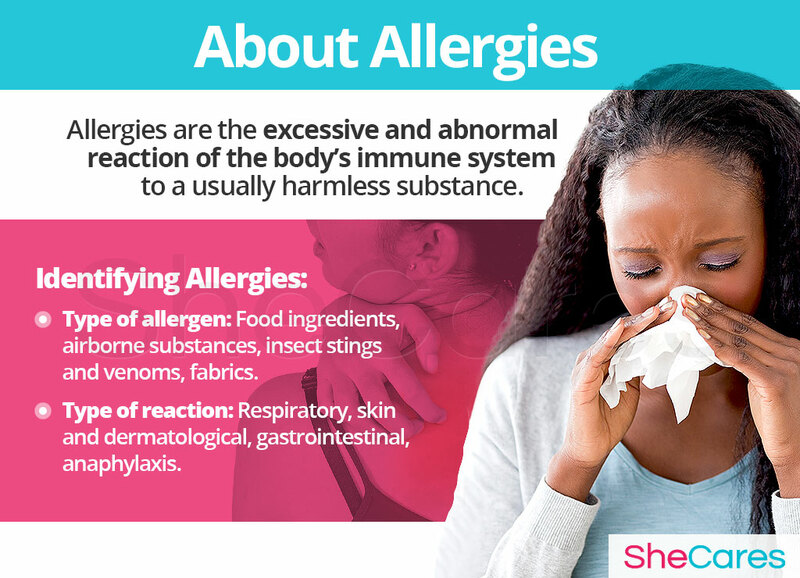 In addition to long-term risk factors, some of them outside a woman's control, each particular allergic reaction is triggered by immediate exposure to a specific allergen. Identifying these allergens and avoiding them as much as possible is key to prevent the reappearance of symptoms and potential complications, such as anaphylactic shock. Some of the most common triggers of allergies include nuts, pollen, and shellfish. There are also some substances and lifestyle choices that have been linked to both increased frequency and severity of allergies. 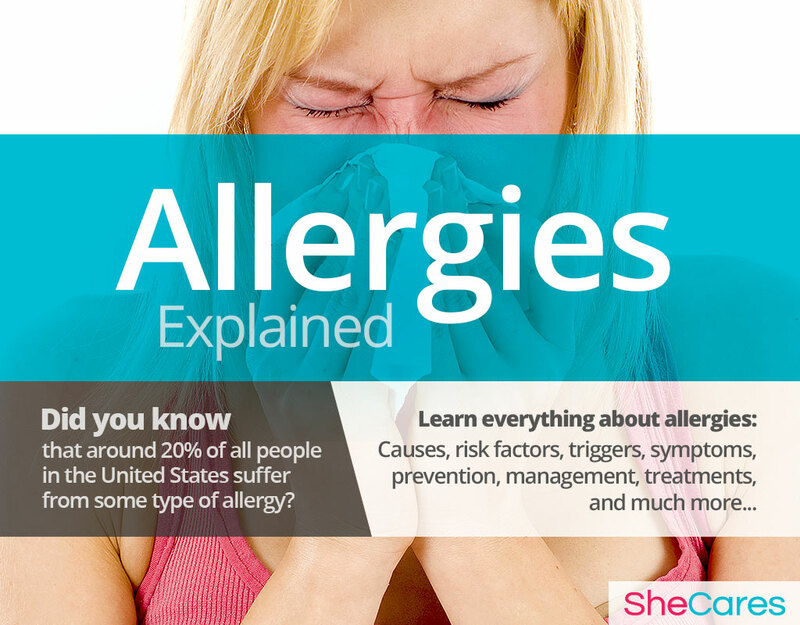 Each woman experiences a particular type of allergic reaction and is allergic to varying triggers. However, many symptoms of allergies are more common or easy to identify, especially for women going through a phase of hormonal imbalance. Sometimes accompanied by eye discomfort such as watery, red, or swollen eyes. To diagnose and identify the symptoms of allergic reactions, a doctor must typically perform three procedures. First, they should review the patient's medical history; then, they should conduct a physical exam, followed by an allergy exam. The doctor may order additional tests if necessary. Medical history. A doctor's diagnosis will focus on discovering the underlying condition that is causing the allergic symptoms. To assess whether a woman's symptoms are being caused or exacerbated by a hormonal issue or another health concern, a doctor may ask about previous medical conditions, any medication being taken, and current life events (e.g. entering puberty, becoming pregnant, or beginning or ending menopause). In addition, the doctor may inquire about any allergies suffered by immediate family members, or, in the case of a food allergy, he may ask you to keep a diary with records of the appearance of the symptoms and any foods eaten that day. Physical exam. This will be necessary for a doctor to make a diagnosis. During this exam, a woman can expect the following information to be taken: blood pressure, heart rate, temperature, and weight. Unusual or excessive fluctuations in these vital signs can be a sign of a hormonal imbalance or other underlying conditions. Tests. If deemed necessary, the doctor may also order tests either to diagnose the allergen itself or to rule out other conditions that could be aggravating the allergy. An allergy test will be taken in order to determine what the exact allergen is. There are three, main types of allergy tests: skin prick test, blood test, or a patch test. The first type consists of pricking the skin with a tiny amount of the suspected allergen in order to see if there is an immediate reaction. When there is risk of an extreme reaction or the suspicion of a rare allergen, the doctor may recommend a blood test instead to measure the amount of IgE antibodies. Sometimes, patients with allergic eczema will be recommended to take a longer patch test that requires the patient to wear special metal discs containing the allergen taped around the skin for at least 48 hours. Other tests that may be useful include a complete blood count (CBC) or a white cell count. Usually, when an allergy is first developed, the symptoms tend to be mild. However, if contact with the allergen persists (especially for food or medication allergens), a stronger, potentially life threatening reaction may develop, known as anaphylaxis. Although rare, anaphylaxis may be fatal. So, it is important to watch out for its specific signs. Women who experience severe and frequent allergies may wish to treat or even prevent them. Keep reading below to learn more about how to prevent allergies. While there is no single way to completely prevent allergies, just as there is no way to stave off hormonal processes, there are a few steps that a woman can take to lessen her chances of developing new allergies, or to minimize the impact or length of time that symptoms occur. In this sense, lifestyle changes for prevention are extremely important, especially in regard to diet, exercise, and healthy habits. Moreover, a woman may seek ways to complement these lifestyle approaches with the use of supplements that help to enhance the endocrine system and, therefore, help to prevent or ease symptoms of hormonal imbalance, like the development of new allergies. For women who have already developed an allergy, prevention may no longer be possible. Fortunately, there are many ways to prevent the “flare-ups” or lessen the intensity of the allergic reaction. Keep reading to learn about the different ways to manage allergies. 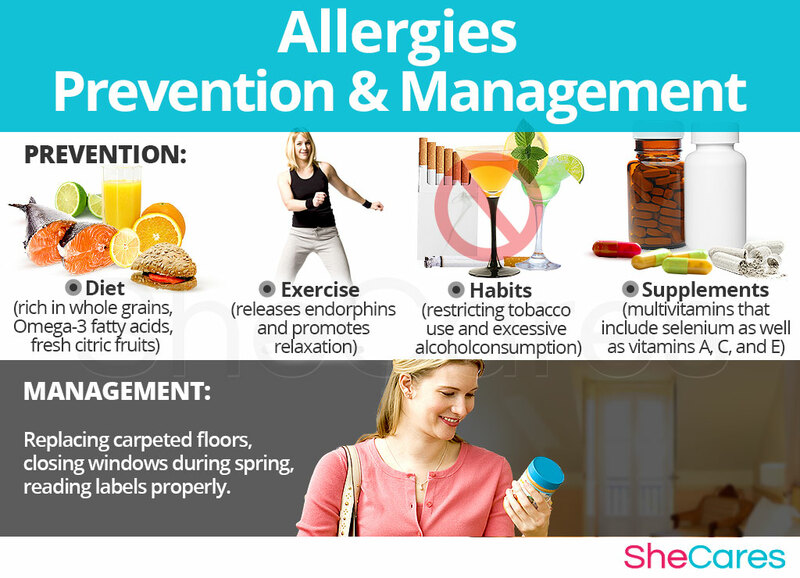 Once a woman has been diagnosed with an allergy and identified the allergen, there are some minor daily changes that can provide a great difference when managing allergies. Avoiding the trigger. Sadly, once an allergy has developed, there is not much left to do except avoiding the allergen. Even if this may not always be completely possible, the less women expose themselves, the better. Getting rid of carpeted floors. If an airborne allergen such as dust, mold, or pet dander has been identified, consider removing any carpeted floors and replace them with vinyl, linoleum, hardwood, or laminated floors. Getting a powerful vacuum. A vacuum cleaner with a HEPA (high efficiency particulate air) filter can more effectively get rid of dust and mold. Women should remember to vacuum not just the house, but any soft toys, stuffed animals, and cushions regularly. Stuffed animals and cushions should also be washed in hot water regularly. Keeping windows closed during spring. Especially for women who live in suburban areas o who may need to commute across rural or grassy areas, it's best to close up the home and car windows during allergy season. Keeping petroleum jelly at hand. Many times, it is not possible for women with hay fever to avoid parks and flowers altogether. Softly smearing the insides of your nose with petroleum jelly can help trap the pollen and avoid or lessen the reaction. Learning to read labels properly. While many women already have a habit of reading the nutritional content of their foods in order to know how many calories each snack has, once a food allergy diagnosis has been made, it is important to learn to read the ingredients list as well and to be able to interpret it correctly. In most jurisdictions, manufacturers are required to label the most popular or more dangerous food allergens (such as gluten, nuts and milk), but sometimes, non-edible products may contain hidden allergens, such as body lotions (that may contain tree nut oils), makeup (may contain soy, wheat, or sesame oil), and certain toothpaste flavorings (which may contain berries). Eating out the smart way. Many restaurants have “special seasoning blends” or “house dressings” that may contain an allergen, even if the exact ingredient is not listed on the menu. The best bet is to always ask the staff directly and be very specific when describing the allergy as an issue. In addition, “buffet” or “all you can eat” places have a large chance of cross-contamination from dish to dish. So, it's best to avoid such places altogether. Always being ready. At some point, it will be inevitable to come across that dreaded allergen. For women who suffer from food allergies (which tend to have more severe symptoms and carry a higher risk of anaphylaxis), it is best to be prepared at all times. Carry an emergency dose of epinephrine, and be ready to apply it if necessary. Alternative treatments are also a great way to manage symptoms of allergies. 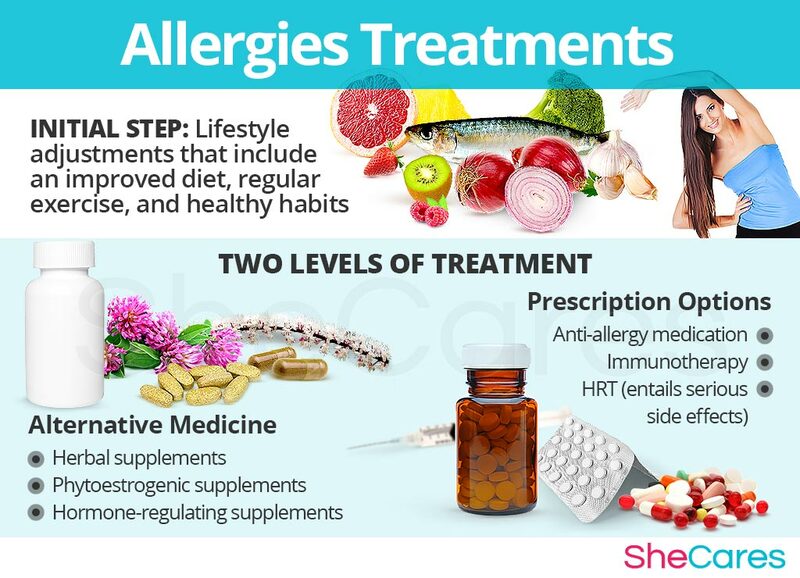 These treatments will not tackle the hormonal cause behind most women's symptoms of allergies, but they can be effective in reducing their severity on the short and medium term. These alternative therapies include acupuncture and neti pots. While these measures often help to reduce the frequency and intensity of allergic symptoms, they are unable to treat the root of the problem, which in most cases is hormonal imbalance. However, there are several natural treatments that can treat the hormonal causes of allergies. Please continue to the next section to learn more about treating allergies. Mold allergy is very common, but since molds are so small, many women do not relate their allergy symptoms to these fungi creatures. Alike other allergies, mold allergy is difficult to manage, but some practices, such as controlling humidity in the house, might be helpful in preventing mold's growth, thus lessening the allergy symptoms. In efforts to avoid the side effects of some allergy medications or to complement the conventional treatments, many women turn their attention towards more natural ways to relieve allergy symptoms, such as acupuncture or herbal decongestants. They do not offer a cure, but can help survive the allergy season with little more ease. Although not always understood by science, home remedies have been shown helpful in alleviating the most common symptoms of allergies, like sinus congestion and sneezing. Steam inhalations, acupuncture, or HEPA filters are some of the ways in which you can effectively lessen your allergies and protect yourself from allergen exposure. 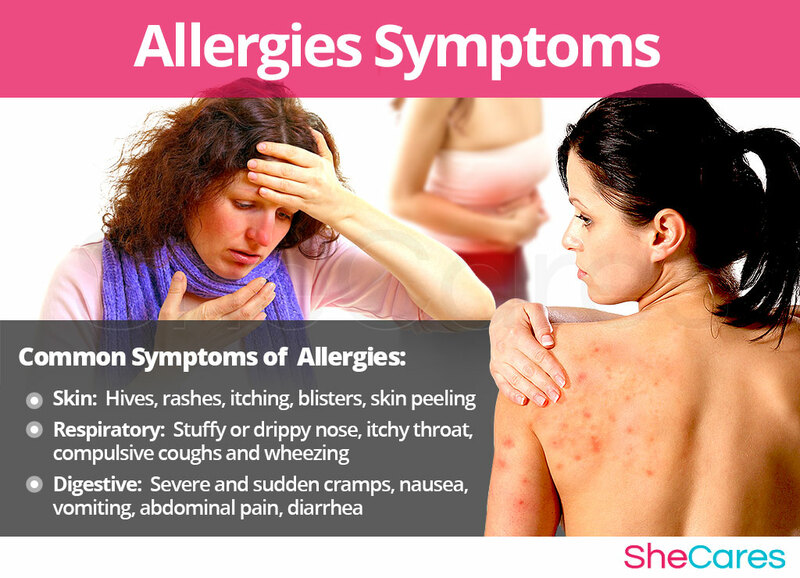 Because sometimes the allergen can't be completely avoided, suffering from allergies can be very frustrating for many women. Luckily, there are some ways to further manage and treat allergies. Three levels of approaches can be considered for aiding allergies. These are categorized as: (1) Lifestyle changes, (2) Alternative Medicine, and (3) Pharmaceutical Allergies. Women are encouraged to begin with the least risky approach to allergy symptoms treatment, lifestyle adjustments. While these are often effective at lessening the symptoms of the disorder, they alone do not address the most common cause of the development of new allergies in women -hormonal imbalance. Fortunately, alternative medicine can be combined with lifestyle changes to provide a safe and effective allergy relief program. While medical intervention is not usually necessary, some women may wish to consider drug options if they are unable to find relief from natural treatments. For women considering this option, it s important to understand, and carefully weigh out the risks associated with such a course of treatment. This primary level of allergy relief involves the least amount of risk, though conversely it requires the highest amount of self-discipline. Many times, some simple changes in lifestyle can reap huge benefits in fighting allergies and achieving a higher overall level of health. Fundamentally, an improved diet, regular exercise and healthy habits can do a woman great service. While these changes will help alleviate many symptoms of allergies, they do not address the problem directly at the hormonal source. So, further treatment may be necessary. Alternative medicine has proven to be excellent for providing allergy relief in a safe and natural way. Alternative approaches involve little to no risk and can be an extremely effective way to relieve symptoms of allergic reactions. In the case of herbal supplements, there are two main types that can be used: phytoestrogenic and hormone-regulating herbal supplements. These supplements, such as black cohosh, contain estrogenic components produced by plants that complement the low estrogen hormones in a woman's body and, thus, may help alleviate allergies. By introducing plant-based estrogens into the body, these herbs treat the underlying estrogen deficiency behind allergies. They are mainly effective for menopausal women who are more likely to have low estrogen levels but are not necessarily effective for women in other stages of life, such as puberty. These supplements can be considered the safest and most natural way to treat the underlying hormonal imbalance behind allergies and can be taken throughout a woman's life as they support the body's natural hormone production. Additionally, there are some other types of supplements that can also alleviate symptoms of allergies or at least make them more manageable, including quercetin extract, stinging nettle, and peppermint. A combination of approaches is usually the most effective route to take. Lifestyle changes combined with alternative medicine will most likely be the best way to alleviate the symptoms of allergies. However, for some women, the symptoms will be so severe that a more drastic treatment will be necessary. Interventions at the third level involve the highest risk and often the highest costs. Not all treatments are suitable for women at every life stage. For example, pregnant women are strongly discouraged from taking even common over-the-counter pills such as Advil. So, a physician should always be consulted. There are two main types of pharmaceutical options that can be prescribes to treat allergic symptoms: anti-allergy medication and hormone-regulating medication. Furthermore, extreme cases of allergies may warrant immunotherapy, and women at risk of anaphylaxis may require epinephrine at some point. If a woman's allergic reactions are at the level of severity that she is still considering these final options, it is wise to speak to a healthcare professional for guidance. These three levels of approaches are not mutually exclusive. A woman may use different approaches at different times or any combination of them, depending on the duration and severity of the symptoms. Today, more and more women find that dealing with symptoms of hormonal imbalance is best accomplished via a combination of healthy lifestyle and alternative treatments. Phelps, K. & Hassed, C. (2011). Allergies: General Practice, The Integrative Approach Series. Australia: Elsevier. Available from Google Books. Raffelock, D. et al. (2002). A Natural Guide to Pregnancy and Postpartum Health. New York: Avery. Available from Google Books. Venes, D. (2017). Taber's Cyclopedic Medical Dictionary. Philadelphia: F.A. Davis Company. Available from Google Books.